For more "Word-Filled Wednesday" posts visit The 160 Acre Woods. First off, congrats on your win over at Tonya's. How EXCITING!!! This is such a perfect picture with this word. Do you do this yourself? Great picture and verse dear one. Love the picture! The verse is an encouragement and inspiration for us to be busy in the work of the Lord! Absolutely stunning, Melanie. A great picture for this verse. Happy WFW to you! That field is so vibrant!! Makes me want to run right through it! Oh how I love this! Beautiful photo and I love that scripture! Susan's comment reminded me to congratulate you on winning Tonya's giveaway. I smiled when I read you had won. Would you mind sharing with me what software you use for placing your text for WFW? Thanks! GORGEOUS PHOTO! Seasonal ... and what an awesome reminder! 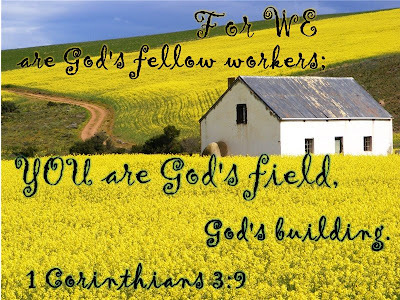 We are his workers AND the field is ripe for harvest! Wow!!! What a fabulous picture. I would love to see it in person, wherever it is. Thanks for a great WFW! That is just a perfect gorgeous photo to illustrate that verse. Well done! Happy WFW! Blessings Melanie...perfect photo, so full of His amazing glory with a great choice of verse! Your fields will be harvested with a great blessing from your warm heart & your labor! You bring sunshine in His field with your smile! May your day be full & enjoy WFW! Hey...I saw you were a WINNER at Tonya's...congrats! I LOVE this image and verse!! What a gorgeous picture! And how humbling to think that we are God's fellow workers, that we work alongside Him... that is just amazing and gives me some "pondering material" today! Hi Melanie, great post for today. You have a beautiful website. This is so beautiful! I love the bright yellow of the picture. Have a great afternoon! Oooooh I just read you won something... Ill have to go see what you won!!! CONGRATULATIONS!!! Gonna go read more on your blog ! Perfect! You couldn't have picked a better picture for the verse, nor a better verse for the week. Thanks so much for stopping by my blog... and blessings on the rest of your week! Is that near you Melanie? that's gorgeous! Ads for a Cause - Where Should the Funds Go?